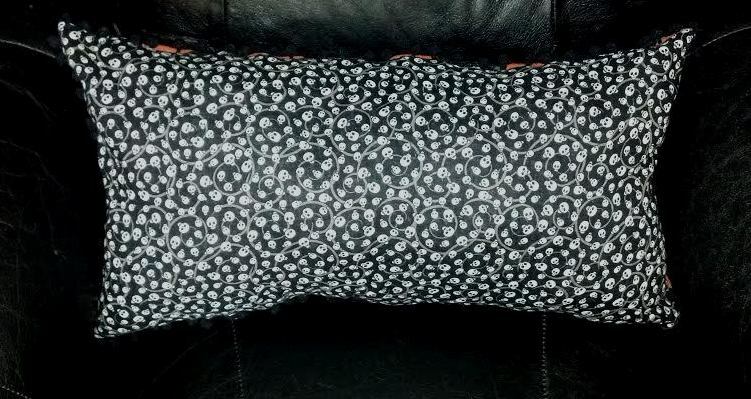 Here’s a different way to decorate for the best holiday of the year; a pillow for your living room (or for your kids – mine have already claimed this one!). 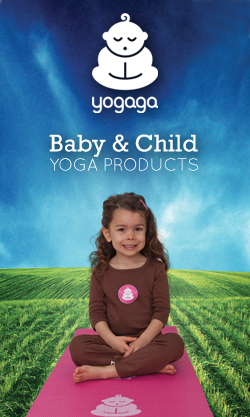 This is an extremely low-budget project. I made mine from stuff I already had around the house. But then again, I am a craft hoarder! 1. 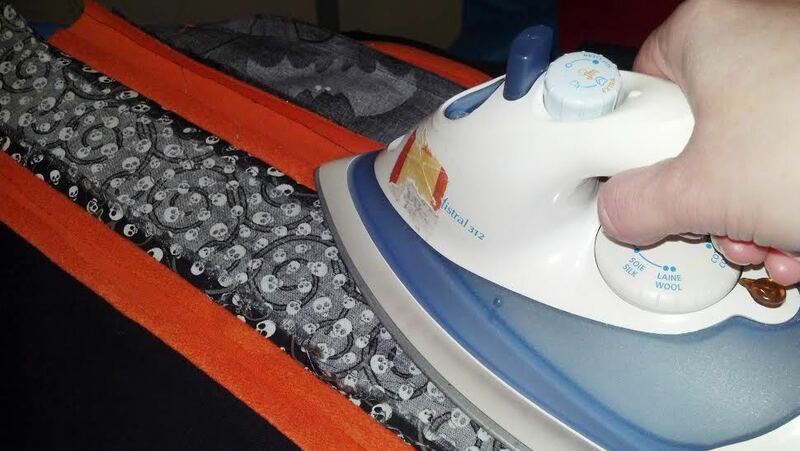 Tear or cut fabric into strips. 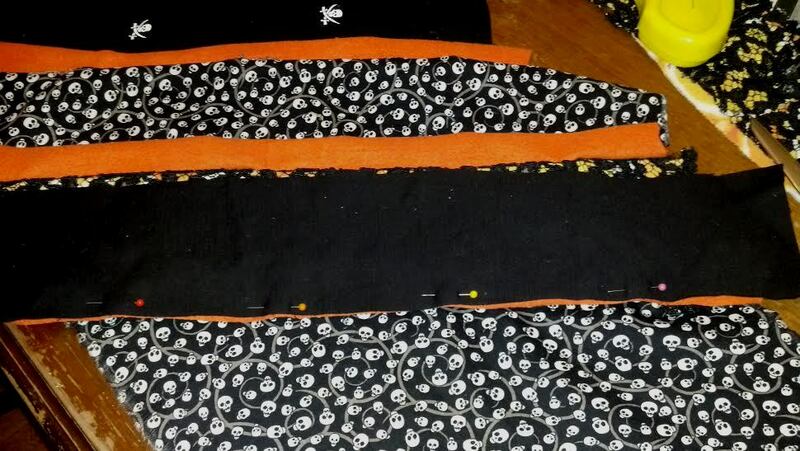 I chose to make the black strips (most of which were scrap fabric, but some of which were old shirts) approximately 3″ wide, and the orange strips about 1 1/2″ wide. 2. I used one whole piece of fabric for the back, so I cut that next. I then used that piece as a pattern for laying out the strips. I decided on a diagonal pattern, so I laid out the strips and pinned them using the back as a guide. Pin the strips of fabric, using the back fabric as a guide. Decide on a design, and lay out the strips accordingly. 3. 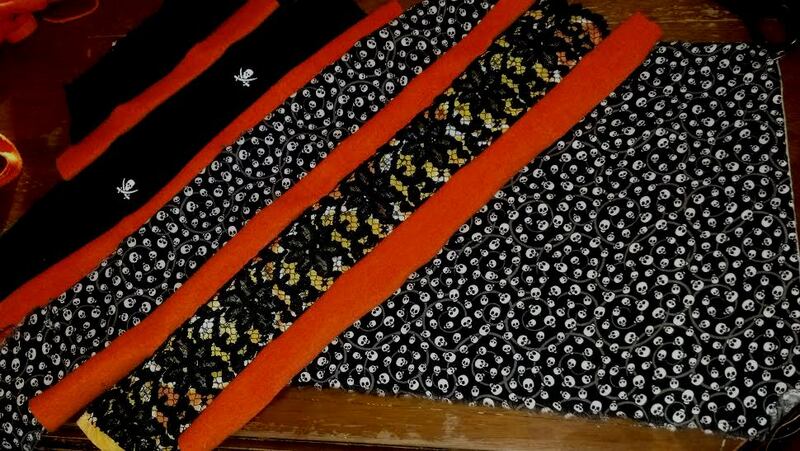 Sew all the strips of fabric together (right sides together) until all strips are joined. 4. Press the seams flat. 5. 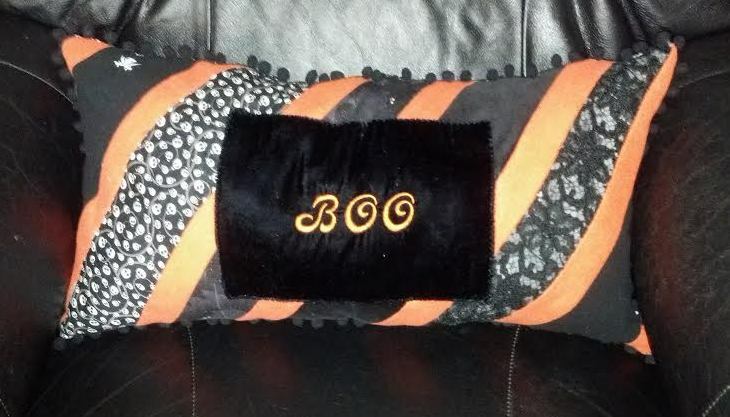 I decided to make my pillow extra scary by adding the word “BOO” embroidered on black velvet. I did this on my embroidery sewing machine, but you could hand embroider a word, or add an applique, if desired. After embroidering the word on the fabric, I simply pressed under the edges, and attached the velvet to the front of the pillow. 6. 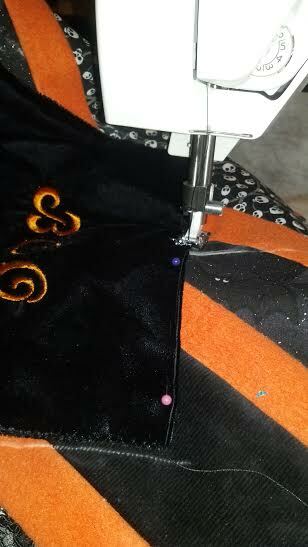 Pin the front to the back of the pillow, and sew, leaving an opening to stuff the pillow in. 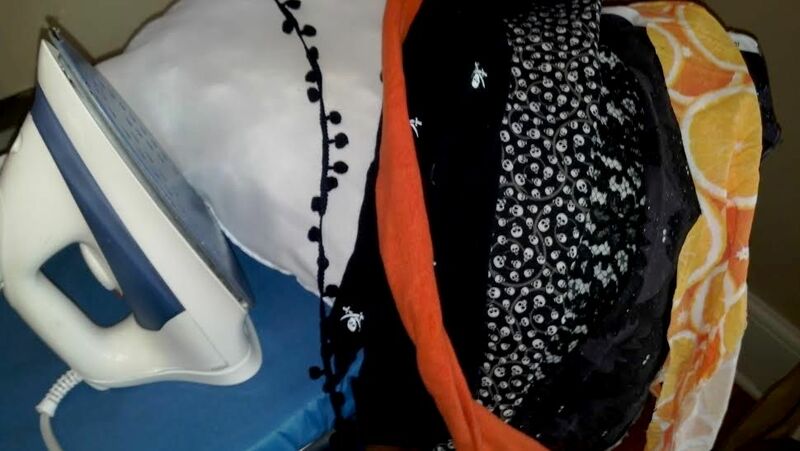 If you want to be able to slip the case off the pillow, simply add a zipper to the back of the pillow in a discreet location. 7. 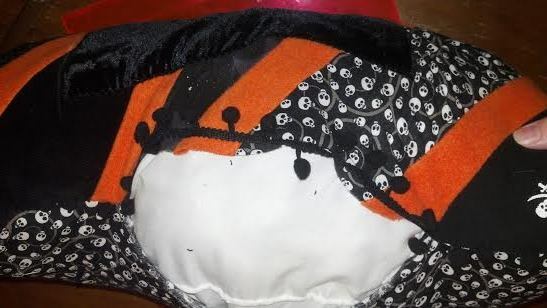 Clip the corners so that there is less bulk when turning the pillow right side out. 8. Stuff the pillow into the newly made pillow shell! 9. 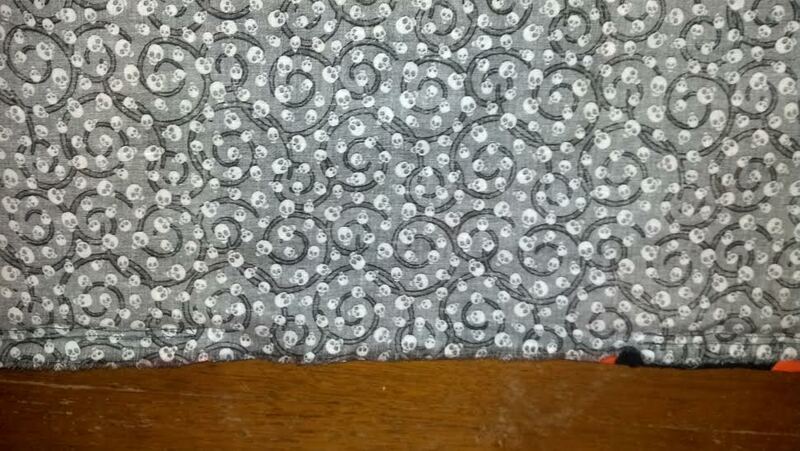 Hand sew the opening, et voila, a super spooky pillow. The back of the pillow.